There is a poster in one of the miles of “skywalks” in the Kalahari entertainment complex in the Wisconsin Dells that says “The only kind of fun at the Kalahari is huge fun.” The ironic potential of this statement is endless. Dan’s professional organization has its continuing education conference at the Kalahari every year in January. We have gone three years in a row with our now four year old daughter Sonia. After Christmas I become perversely excited for our Kalahari trip, even though I never have any fun at all. My excitement is some kind of reflexive reaction to the idea of going to a theme park left over from my childhood. I think I have finally learned that places like the Kalahari can offer me no real satisfaction. Over our three stays at the Kalahari we have learned to try to mitigate some of the expense and inevitable disappointment by coming prepared. After the first trip we learned that it is best to engage a “lodge” room with a full kitchen and bring all your own food even though there are signs everywhere in the entertainment complexes that carry in food is strictly prohibited. I am fully prepared to lie and indignantly say “my daughter has life threatening allergies” if I am ever apprehended. No Kalahari “official” has even looked at me twice when I break out the peanut butter sandwiches and apple slices. Most of the thousands of various attendants at the Kalahari seem to be bored Eastern European teenagers wearing heavy eye make-up. They don’t pose much of a threat. The food available at the Kalahari is literally huge in every sense of the word. There is no way to get a modest sized treat there. If you want a cookie you can get a “loaded” cookie which is a dinner plate sized cookie with no less than six candy bars crumbled on top, all smothered in fudge and caramel. The cookies come in microwaveable trays and are heated up to gooey. You have to use a spoon to eat them and they cost almost eight dollars. You can also purchase enormous candied apples in flavors like “dirt pie” which is a caramel apple rolled in Oreo cookie crumbs and festooned with gummy worms. If you want something healthy you have to pay a premium and they try to choke you on your own sanctimonious choice. The fruit cup is a veritable schooner of sliced fruit and costs close to twelve dollars. The food there is a sort of pornographic fantasy version of food. Literal Big Jugs. The diseased food culture at the Kalahari is particularly difficult because walking though the water park is like watching an endless loop of news footage on “America’s obesity epidemic”. The fun-makers at the Kalahari either have not heard or do not care about how poisonous food made away from home has become in America. It was particularly upsetting to see how heavy the children were. Five year olds with enormous bellies wandered about freely grazing from full sized bags of Doritos or Cheetos as their parents panted with the unaccustomed exercise of walking up the waterslide stairs. Remember everyone is wearing bathing suits too. On this third trip to the Kalahari we did not buy any food out except one hot dog for the ultra picky Sonia who did not eat it declaring it “too spongy.” It was a grim victory. I have learned intellectually that obscene “vacation food” will not make me happy but emotionally I felt totally deprived. Dan was at his conference from 8-5 everyday so I was faced with days of entertaining Sonia without the break that preschool provides. This is a big reason family vacations are not really “fun” in the vacation sense of the word for me. I love spending time with Sonia but I also love the three hour break everyday when she is at preschool. I am confident that Sonia’s preschool is very enriching so I often feel free to relax into some of the less, shall we say, educational activities before and after school, like watching two episodes of Scooby Doo back-to-back. If Sonia is watching Scooby then I can usually check my e-mail or do the dishes (I know big fun!) and not have to worry about providing enriching activities high on parental involvement. I don’t think there are any inherently educational or enriching activities available at the Kalahari. Sonia usually watches a fair amount of PBS kids programming which I tell myself qualifies as educational and enriching. You have to pay to watch PBS at the Kalahari. All PBS kids shows are part of the pay-per-view, on-demand package in the hotel rooms. I think this kind of sums up the Kalahari’s feelings toward healthy options, like with the fruit schooner, if you want healthy than you have to pay for it. So it was up to me to fill up Sonia’s and my day with fun. The water park and indoor amusement park were interesting to Sonia for limited amounts of time but what she really liked was the souvenir shop. Since Sonia was a baby we have spent countless hours in toy stores around town playing with the merchandise. We never buy anything but Sonia will play in a toy store until I drag her out of there. What she really likes are plastic animal figurines and stuffed animals. Specifically she like plastic horses and stuffed big cats. 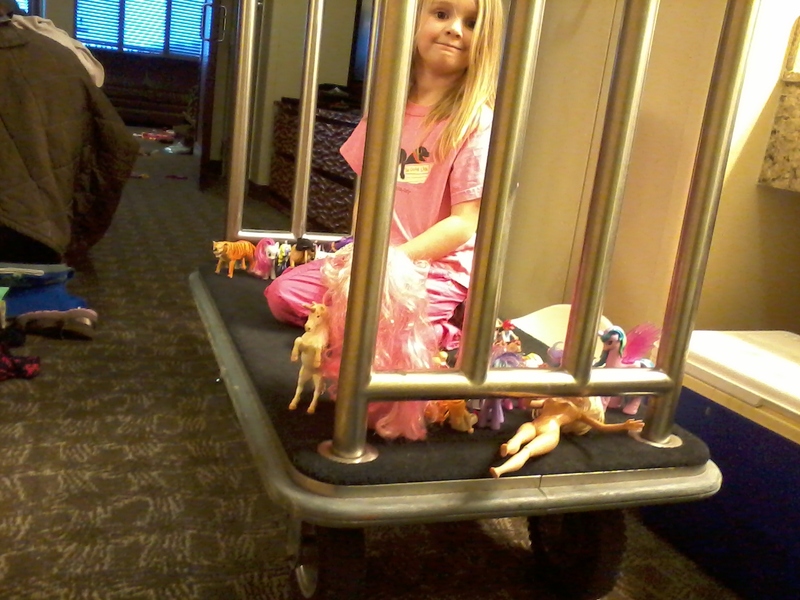 When she was really little, not even walking yet, she would take every plastic horse off the shelf and line them up in a little parade. Since I stay home with her we were able to go to toy stores during dead times like the middle of the day. She will take up a whole aisle with her horse parade, preventing legitimate paying customers from examining the merchandise. Unbelievably we have never been kicked out of a toy store. Sonia enjoying one of her favorite activities. The souvenir shop at the Kalahari was Sonia’s dream come true. There was an extensive plastic animal collection and an entire wall crammed with stuffed cats of every size and texture. Mt heart sank when I saw this place. I knew we would be in there for hours unless I thought fast and came up with some kind of inducement to get her out of there. Then I realized we were on “vacation” we didn’t have to be anywhere or make any deadlines. We were supposed to be having “fun.” So I let Sonia play with the stuffed cats to her heart’s content (one day over an hour). The bored Eastern European teenager manning the store could have cared less. I guess I would have felt happy about how much “fun” she was having on her vacation if the soul-crushing boredom of standing in another toy shop staring into space wasn’t throwing me into acute existential crisis. This entry was posted in Guest writer and tagged food, Kalahari. Bookmark the permalink. I died laughing when I saw the post title as I am at the Kalahari right now . My first trip and in the 30 seconds since I exited the locker room I had pretty much formed the same opinion . I am thinking of it as an anthropological exercise . I particularly like the tattoos . and I also see something I have never seen before . Muslim women in full body and head covering swim suits having fun . that is kind of cool .